Welcome to our dinghy guide central. 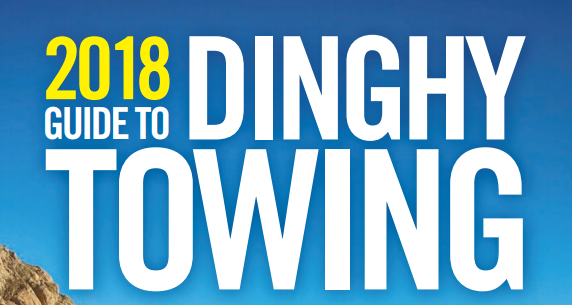 Here, you'll find all our flat-towing dinghy guides going back to 1990 in digital PDF format. Each digital guide is packed with setup tips, additional equipment and a full list of the model year's dinghy-ready vehicles. 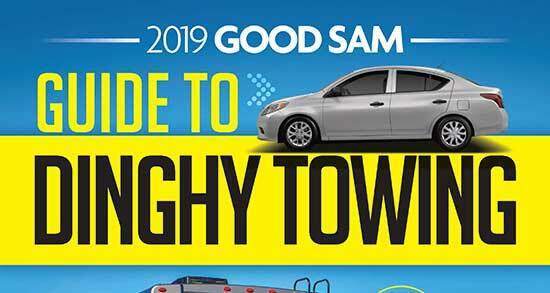 Within this guide you'll find the 2019 MotorHome Dinghy Roundup of all manufacturer-approved flat-towable cars, trucks and SUVs. This guide will also teach you all you need to know before towing your dinghy, from proper equipment, to proper setup. Click on the image above for FREE download. Within this guide you'll find the 2018 MotorHome Dinghy Roundup of all manufacturer-approved flat-towable cars, trucks and SUVs. This guide will also teach you all you need to know before towing your dinghy, from proper equipment, to proper setup. Click on the image above for FREE download. Within this guide you'll find the 2017 MotorHome Dinghy Roundup of all manufacturer-approved flat-towable cars, trucks and SUVs. This guide will also teach you all you need to know before towing your dinghy, from proper equipment, to proper setup. Click on the image above for FREE download. Within this guide you'll find the 2016 MotorHome Dinghy Roundup of all manufacturer-approved flat-towable cars, trucks and SUVs. This guide will also teach you all you need to know before towing your dinghy, from proper equipment, to proper setup. Click on the image above for FREE download. Within this guide you'll find the 2015 MotorHome Dinghy Roundup of all manufacturer-approved flat-towable cars, trucks and SUVs. This guide will also teach you all you need to know before towing your dinghy, from proper equipment, to proper setup. Click on the image above for FREE download. Within this guide you'll find the 2014 MotorHome Dinghy Roundup of all manufacturer-approved flat-towable cars, trucks and SUVs. This guide will also teach you all you need to know before towing your dinghy, from proper equipment, to proper setup. Click on the image above for FREE download. Within this guide you'll find the 2013 MotorHome Dinghy Roundup of all manufacturer-approved flat-towable cars, trucks and SUVs. This guide will also teach you all you need to know before towing your dinghy, from proper equipment, to proper setup. Click on the image above for FREE download. Within this guide you'll find the 2012 MotorHome Dinghy Roundup of all manufacturer-approved flat-towable cars, trucks and SUVs. This guide will also teach you all you need to know before towing your dinghy, from proper equipment, to proper setup. Click on the image above for FREE download. Within this guide you'll find the 2011 MotorHome Dinghy Roundup of all manufacturer-approved flat-towable cars, trucks and SUVs. This guide will also teach you all you need to know before towing your dinghy, from proper equipment, to proper setup. Click on the image above for FREE download. Within this guide you'll find the 2010 MotorHome Dinghy Roundup of all manufacturer-approved flat-towable cars, trucks and SUVs. This guide will also teach you all you need to know before towing your dinghy, from proper equipment, to proper setup. Click on the image above for FREE download. Within this guide you'll find the 2009 MotorHome Dinghy Roundup of all manufacturer-approved flat-towable cars, trucks and SUVs. This guide will also teach you all you need to know before towing your dinghy, from proper equipment, to proper setup. Click on the image above for FREE download. Within this guide you'll find the 2008 MotorHome Dinghy Roundup of all manufacturer-approved flat-towable cars, trucks and SUVs. This guide will also teach you all you need to know before towing your dinghy, from proper equipment, to proper setup. Click on the image above for FREE download. Within this guide you'll find the 2007 MotorHome Dinghy Roundup of all manufacturer-approved flat-towable cars, trucks and SUVs. This guide will also teach you all you need to know before towing your dinghy, from proper equipment, to proper setup. Click on the image above for FREE download. Within this guide you'll find the 2006 MotorHome Dinghy Roundup of all manufacturer-approved flat-towable cars, trucks and SUVs. This guide will also teach you all you need to know before towing your dinghy, from proper equipment, to proper setup. Click on the image above for FREE download. Within this guide you'll find the 2005 MotorHome Dinghy Roundup of all manufacturer-approved flat-towable cars, trucks and SUVs. This guide will also teach you all you need to know before towing your dinghy, from proper equipment, to proper setup. Click on the image above for FREE download. Within this guide you'll find the 2004 MotorHome Dinghy Roundup of all manufacturer-approved flat-towable cars, trucks and SUVs. This guide will also teach you all you need to know before towing your dinghy, from proper equipment, to proper setup. Click on the image above for FREE download. Within this guide you'll find the 2003 MotorHome Dinghy Roundup of all manufacturer-approved flat-towable cars, trucks and SUVs. This guide will also teach you all you need to know before towing your dinghy, from proper equipment, to proper setup. Click on the image above for FREE download. Within this guide you'll find the 2002 MotorHome Dinghy Roundup of all manufacturer-approved flat-towable cars, trucks and SUVs. This guide will also teach you all you need to know before towing your dinghy, from proper equipment, to proper setup. Click on the image above for FREE download. Click on the image above for FREE download. Within this guide you'll find the 2001 MotorHome Dinghy Roundup of all manufacturer-approved flat-towable cars, trucks and SUVs. This guide will also teach you all you need to know before towing your dinghy, from proper equipment, to proper setup. Click on the image above for FREE download. Within this guide you'll find the 2000 MotorHome Dinghy Roundup of all manufacturer-approved flat-towable cars, trucks and SUVs. This guide will also teach you all you need to know before towing your dinghy, from proper equipment, to proper setup. Click on the image above for FREE download. 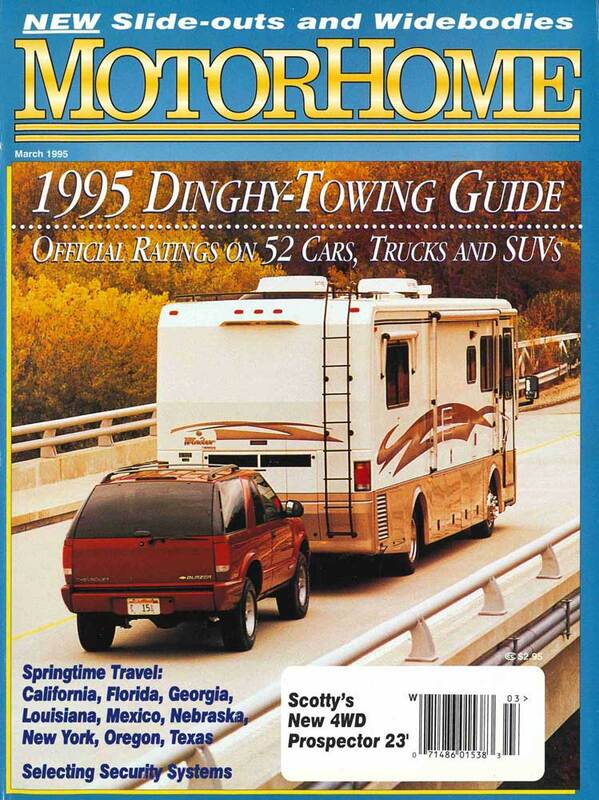 Within this guide you'll find the 1999 MotorHome Dinghy Roundup of all manufacturer-approved flat-towable cars, trucks and SUVs. This guide will also teach you all you need to know before towing your dinghy, from proper equipment, to proper setup. Click on the image above for FREE download. 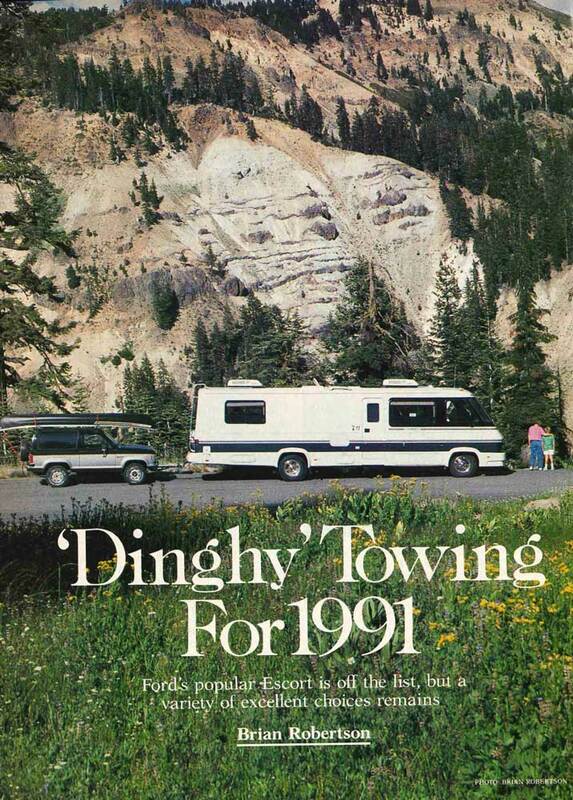 Within this guide you'll find the 1998 MotorHome Dinghy Roundup of all manufacturer-approved flat-towable cars, trucks and SUVs. This guide will also teach you all you need to know before towing your dinghy, from proper equipment, to proper setup. Click on the image above for FREE download. 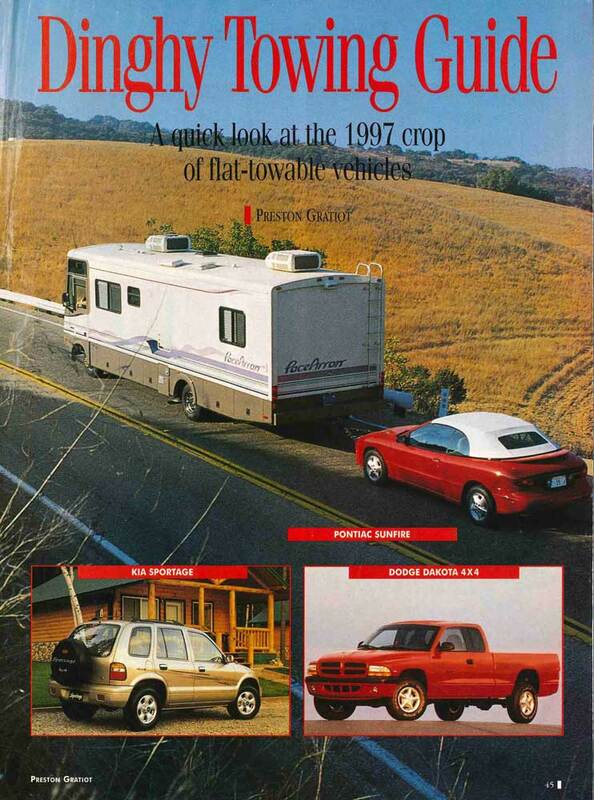 Within this guide you'll find the 1997 MotorHome Dinghy Roundup of all manufacturer-approved flat-towable cars, trucks and SUVs. This guide will also teach you all you need to know before towing your dinghy, from proper equipment, to proper setup. Click on the image above for FREE download. 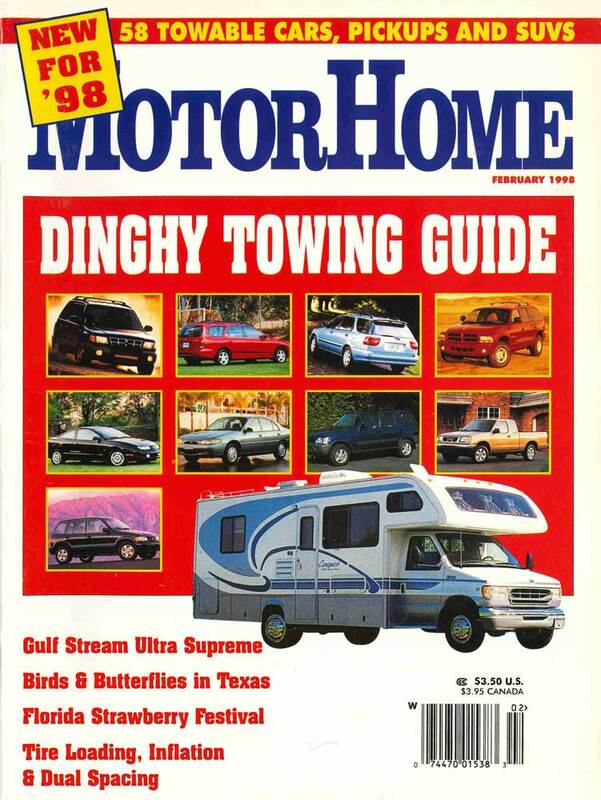 Within this guide you'll find the 1996 MotorHome Dinghy Roundup of all manufacturer-approved flat-towable cars, trucks and SUVs. This guide will also teach you all you need to know before towing your dinghy, from proper equipment, to proper setup. Click on the image above for FREE download. 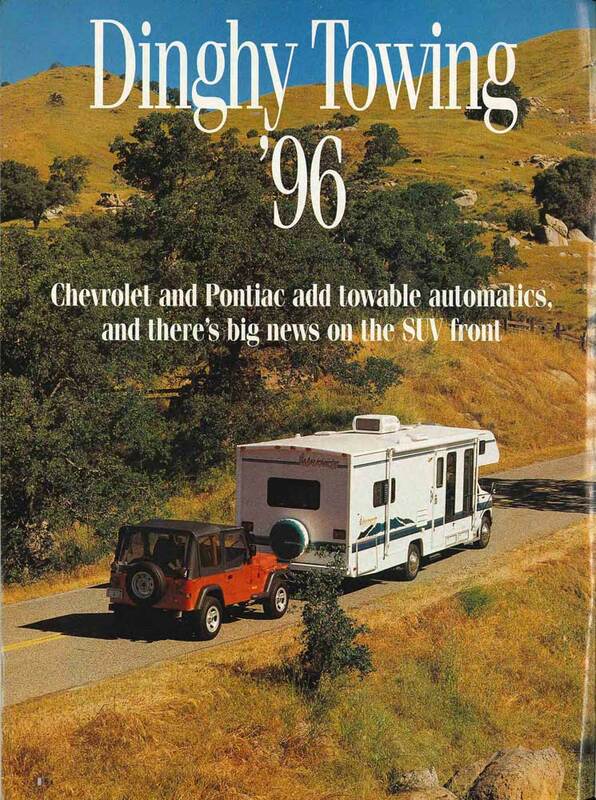 Within this guide you'll find the 1995 MotorHome Dinghy Roundup of all manufacturer-approved flat-towable cars, trucks and SUVs. This guide will also teach you all you need to know before towing your dinghy, from proper equipment, to proper setup. Click on the image above for FREE download. 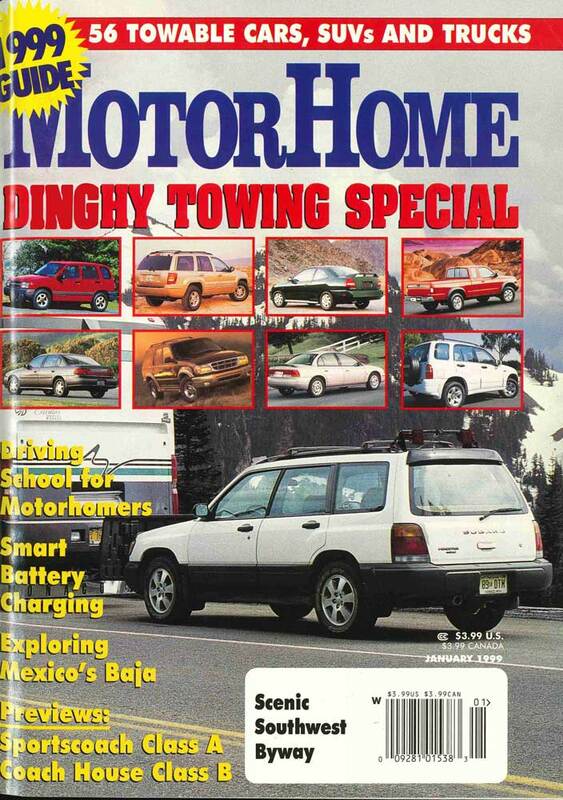 Within this guide you'll find the 1994 MotorHome Dinghy Roundup of all manufacturer-approved flat-towable cars, trucks and SUVs. This guide will also teach you all you need to know before towing your dinghy, from proper equipment, to proper setup. Click on the image above for FREE download. 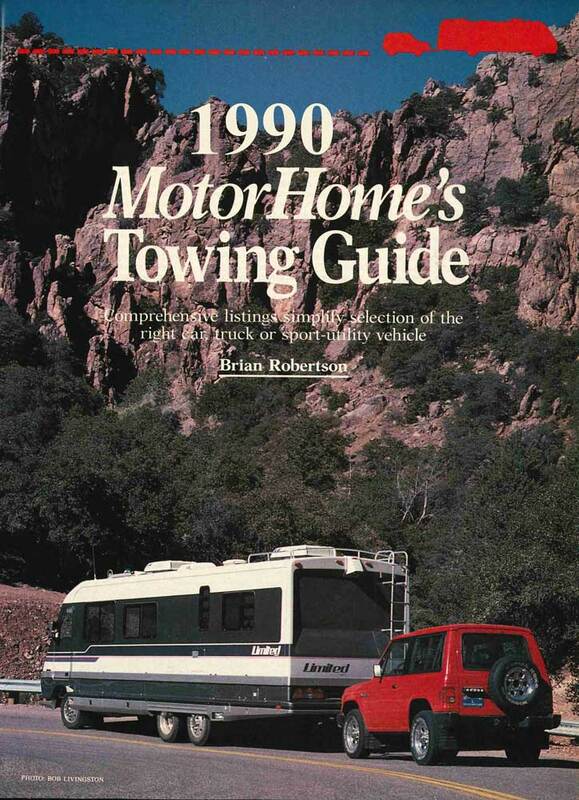 Within this guide you'll find the 1993 MotorHome Dinghy Roundup of all manufacturer-approved flat-towable cars, trucks and SUVs. This guide will also teach you all you need to know before towing your dinghy, from proper equipment, to proper setup. Click on the image above for FREE download. 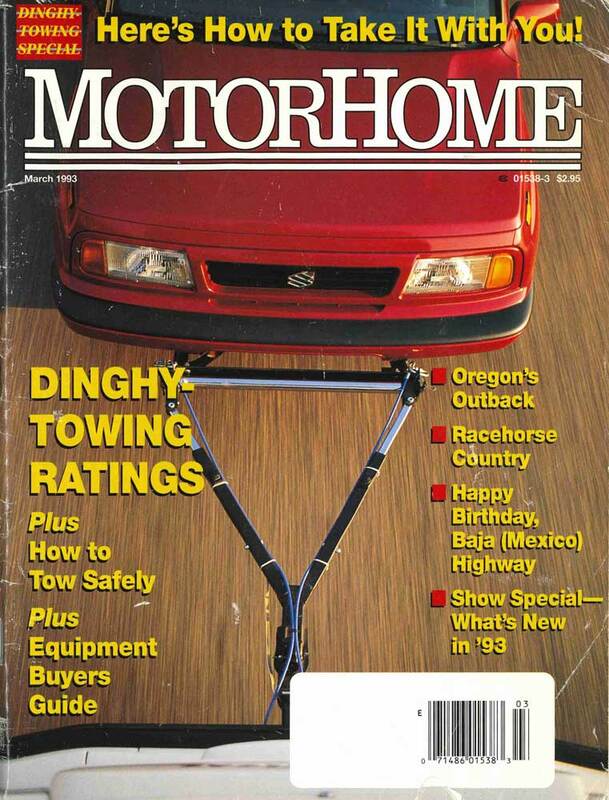 Within this guide you'll find the 1992 MotorHome Dinghy Roundup of all manufacturer-approved flat-towable cars, trucks and SUVs. This guide will also teach you all you need to know before towing your dinghy, from proper equipment, to proper setup. Click on the image above for FREE download. 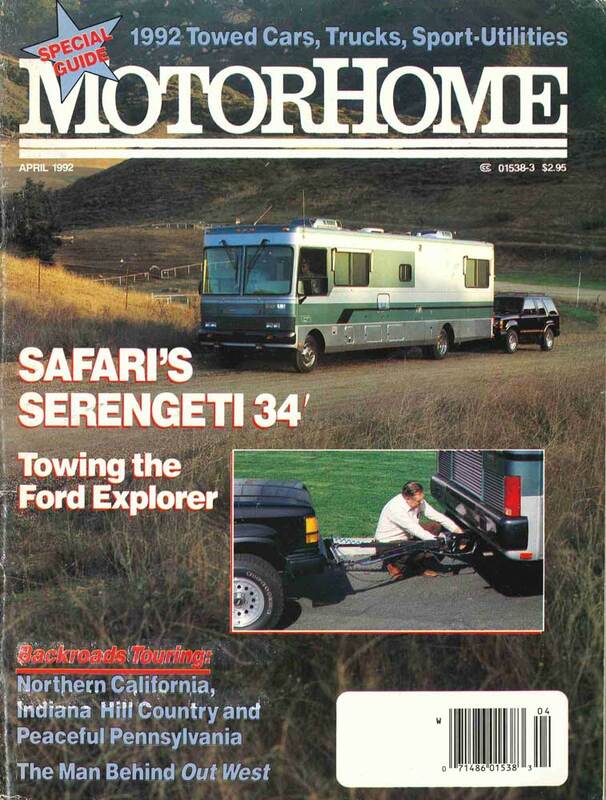 Within this guide you'll find the 1991 MotorHome Dinghy Roundup of all manufacturer-approved flat-towable cars, trucks and SUVs. This guide will also teach you all you need to know before towing your dinghy, from proper equipment, to proper setup. Click on the image above for FREE download. 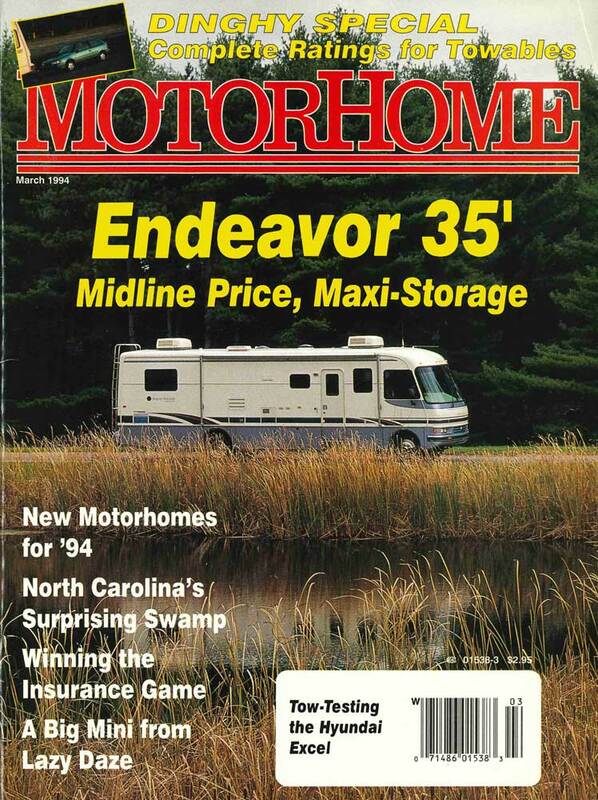 Within this guide you'll find the 1990 MotorHome Dinghy Roundup of all manufacturer-approved flat-towable cars, trucks and SUVs. This guide will also teach you all you need to know before towing your dinghy, from proper equipment, to proper setup. Click on the image above for FREE download.